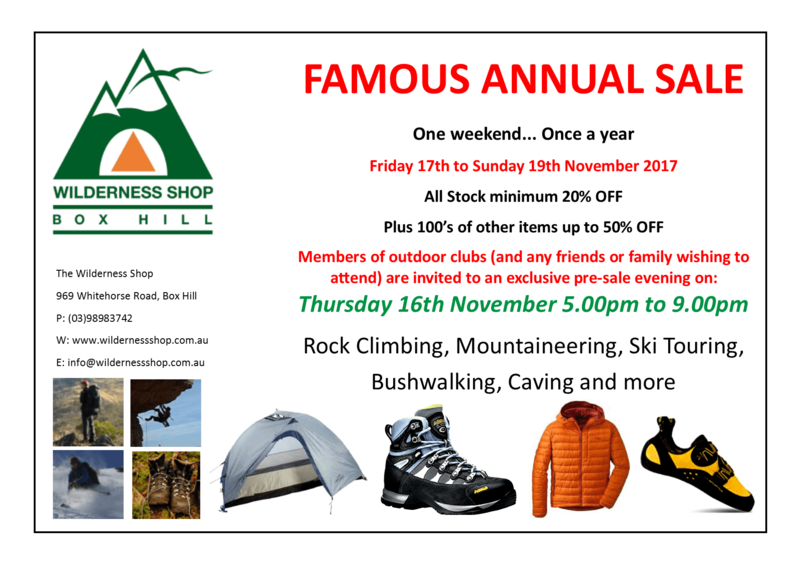 The Wilderness Shop Annual Sale is scheduled for Friday 17th to Sunday 19th November 2017. Thursday 16th November 5.00pm to 9.00pm. All stock will be a minimum 20% OFF (normally 10% off for club members). In addition there will be hundreds of other specials at 30 to 50% OFF. Make an effort to get there on the Thursday if you want the super specials – only available while stocks last! Note that The Wilderness Shop is a long time supporter of the VCC. It also donates a prize each year for the annual Trip Leader Rewards Raffle.